PA chairman says PA is ready to resume peace talks with Israel on basis of international law and relevant UN resolutions. 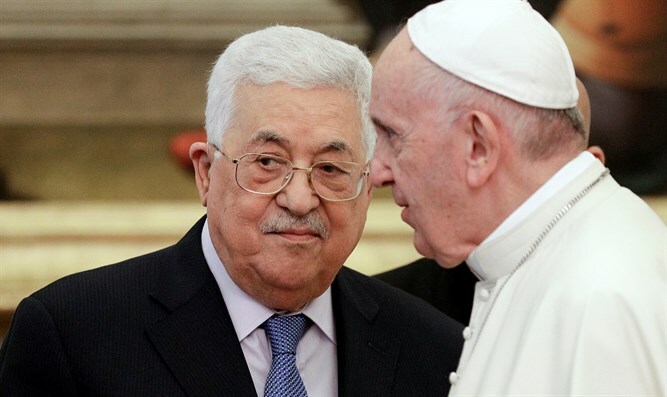 Palestinian Authority (PA) chairman Mahmoud Abbas on Tuesday welcomed Pope Francis’ call for the resumption of dialogue between Israel and the PA, the WAFA news agency reported. In his Christmas message, the Pope said he hoped the festive season would lead to a resumption of peace talks between Israel and the PA.
"May this Christmas help us to rediscover the bonds of fraternity linking us together," he said, adding, "May it enable Israelis and Palestinians to resume dialogue and undertake a journey of peace that can put an end to a conflict that for over 70 years has rent the land chosen by the Lord to show his face of love." Abbas affirmed the PA’s readiness to resume peace talks with Israel on the basis of the international law and relevant United Nations General Assembly and Security Council resolutions, according to WAFA. The Pope met Abbas several weeks ago at the Vatican, and called for the implementation of a “two-state solution” to solve the decades old Israel-PA conflict. Despite Abbas’ claims that he is willing to resume negotiations with Israel, he has continuously imposed preconditions on talks and has ignored calls from Prime Minister Binyamin Netanyahu to sit down for negotiations.